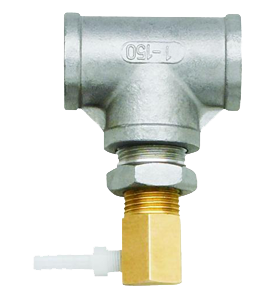 Temperature management valve for use on all UV brands and models with 1 inch inlet/outlet to reduce temperature build-up during long periods without water flow. Particularly recommended for systems incorporating high-output UV lamps and UV intensity monitors including Viqua UVMax Models E4+, E4-50+, F4+, F4-50+, and Viqua models VH410M, VP600M, and VP950M. Sometimes used to add additional cooling on UVMax G+, H+, J+, K+ and Pro series models. The temperature management valve is fully automatic and is installed on the outlet port of the UV chamber. It discharges a small amount of water when the system reaches a preset temperature. This valve is perfect for applications with extended no-flow conditions, as it allows the lamp to operate within its optimal operating parameters.